Fleas on dogs means fleas in your house. Yes, those fleas are jumping on and off your dog like a circus ride. The last thing your dog needs are fleas and flea bites. The last thing you need are fleas in your home. Humans can get flea bites, too. So watch out! Local pet stores have racks of chemical flea products. The vet’s office is just waiting for your yearly stock up of Revolution flea control, Advantage flea medicine, Frontline flea and tick treatment or Bravetco which is really fluralaner, a systemic insecticide and acaricide ( kills members of the spider family such as ticks ) that is given by mouth. The U.S. Food and Drug Administration approved it under the trade name Bravecto for flea treatment in dogs in May 2014. The EU approved it in February 2014. Here is the chemical formula C22H17Cl2F6N3O3...what? NO. Don't do it! If your flea infestation problem gets too bad, your home might need to be fumigated. Horrors! You should be aware that insecticides are # 2 on the list of Top 10 Dog Poisons. Despite the use of these harsh, chemical, pest control products for pets, our dogs and cats are still getting fleas and ticks. So what's the point in using them? Are you poisoning your pet for nothing? I want you to know that there are better, more natural alternative solutions for natural flea control. These methods can help you get rid of fleas on dogs and fleas in the house, once and for all. They are an excellent tick repellent too, and are good for preventing mosquito bites and taking the itch out of bug bites. Here's a short youtube video you can watch to learn more. I'm talking about chemical pesticide flea treatments compared to natural products that work just as well, and keep your dogs healthy at the same time. Some house cleaning tips too! Fleas are blood sucking parasites. Fleas are predators. They will seek out weak, unhealthy, sick or elderly animals as a host. Fleas and ticks, mosquitoes and other biting insects need a blood meal to survive and lay their eggs. 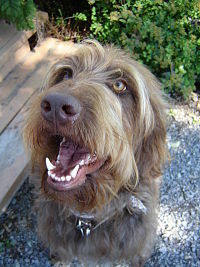 They are attracted to your dog's body heat and body chemistry ( odor ). 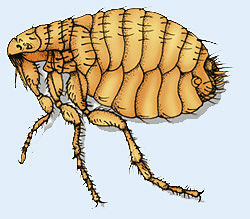 Fleas will invade an animal that is improperly nourished, sick and weak, toxic or under stress. This is where good canine nutrition plays an important part. Good, nutritious, healthy natural food, will go a long way toward keeping your dog's immune system healthy and functioning optimally. Healthy lifestyle habits are just important for your dog as they are for you. Fleas are dangerous because they pose a health risk to humans and animals both. Your dog does not need the risk of health problems that come with fleas. Fleas are particularly tough, resilient, and plentiful. 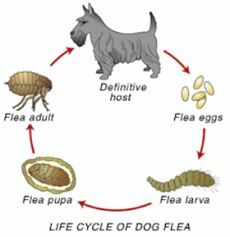 If a male and female flea are placed in a new home, and given adequate food, such as the blood from your dog or cat, they will breed. This has the potential to produce a population of millions of fleas, in less than a month. Yikes!!! Statistics indicate, that for all the advances made in chemical flea treatments, our pets are more plagued by this problem today than ever before. Here are some of the reasons why. Changing weather patterns and global warming. Fleas now have more hatching life cycles before the frost of coming winter. Weaker Immune Systems from the use of chemical pesticide products, the unnecessary use of antibiotics, steroid drugs and the overuse of vaccines. Fleas adapt to toxins. They develop a tolerance to and thrive on the chemicals used to get rid of them. This is the exact same problem as bacteria and virus mutation, due to the overuse of antibiotics. Mother Nature is smart. She will find a way for her critters to thrive, regardless! My dogs and cats never have a flea problem and my house is flea free ! So, I want to share with you my personal suggestions and natural alternative options for getting rid of fleas and preventing bug bites from other biting insects too. The ultimate goal always, is to help your pets get healthy enough that fleas will not be attracted to them at all. Here are a few things you can do to improve the level of health your dog is experiencing. If your dog is healthy, he will be less likely to get fleas. Holistic natural remedies for fleas is less expensive in the long run and won't harm your dog's health. You will save money if you don't buy those nasty, toxic and potentially dangerous poisonous insecticide chemicals used for fleas on dogs and cats. This flea makes me feel itchy just looking at him. 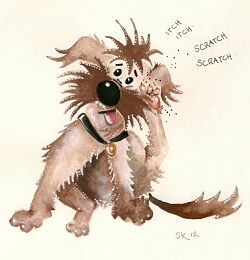 So, if there are fleas on dogs, then everyone in the house will be scratching, not just the dog! An entire industry is dedicated to solving the flea problem for you. Products used for getting rid of fleas are chemical insecticides. 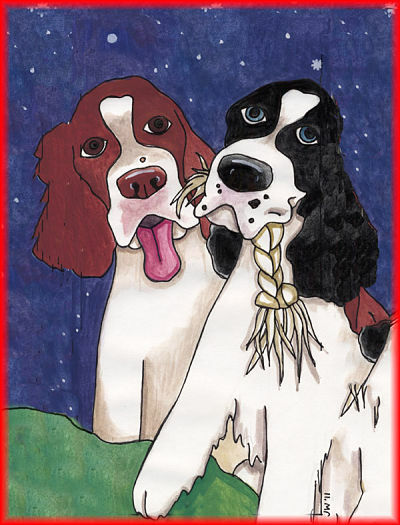 Join our Dog Nutrition Naturally Newsletter Community.